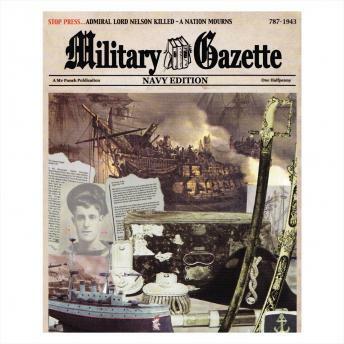 The Military Gazette, is a vivid portrait of military life through the centuries, as lived by the generations of men and women who took part. We eavesdrop on some of the most turbulent and colourful events, from bow & arrow to atomic bomb, we draw on the first hand experiences of Englishmen and women, as they provide a fascinating and often moving description of the British at war. The Navy edition journeys from the Anglo Saxon Chronicle's account of a Viking invasion to a young sailor's grief at the death of Horatio Nelson; from the Spanish Armada to the Battle of Jutland and from organised press gangs to murderous mutinies we share the personal experiences of life in the British Navy. Narrated by Eileen Atkins; Cheryl Campbell; Nigel Davenport; Alex Jennings; Richard Johnson; Hugh Laurie; Michael Maloney; Geoffrey Palmer; Michael Pennington; Prunella Scales; Samuel West, and John Wood.